So we got to the party a little late for this one. Amid rumours that Singapura: The Musical was going to close earlier than expected, we decided to hold our horses. 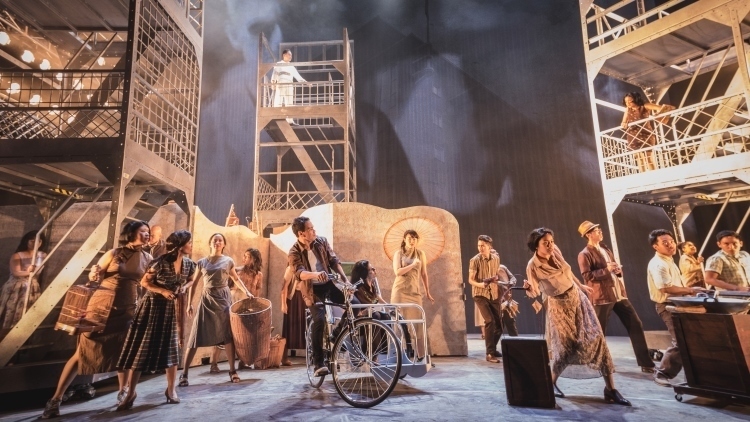 But once The 4th Wall, the Filipino company behind the production, confirmed that it will go on for a couple more weeks – although the exact closing date has been adjusted a few times since – we headed for the beautifully refurbished Capitol Theatre. We’re glad we waited. The musical has been cast in a pretty negative light so far, but it’s since had time to settle in and for minor elements to be tweaked. And while the show we saw had its flaws, there’s plenty of promise – all hope is not lost. Singapura tells the story of the Tan family, headed by bus driver Tan Kok Yang (Juliene Mendoza) and his wife Bee Ling (Maybelle Ti) as they struggle through the decade prior to Singapore’s independence. It centres on the smart, headstrong daughter Lee May (Marian Santiago), who goes to law school to learn to fight for what she believes in and ends up caught in a love triangle between British officer Lieutenant Flynn (David Bianco) and her Malay childhood friend Adam (Reb Atadero) – no doubt emblems for the two sides that Singapore was caught in between at the time. By now, most people would have read the reviews, which definitely do make salient points. At almost two and a half hours, the show is too long. Parts such as the Empress Dowager drifting across the stage at the beginning, or the song during which dancers from different races that make up Singapore come together, can – and should – be cut altogether. On other fronts, we saw things a little differently. The inconsistent accents that many have flagged up, for instance, hardly bothered us. Sure, you can tell that the mostly Filipino actors are not native Singlish speakers, and their manner of speech understandably doesn’t go down well with the local audience. But when – or if – it does travel to other countries, their relatively neutral accents, lightly tinged with traces of our dialect, will hardly be a concern. Off to see the world, Ma! Singapura is, ostensibly, a family drama – not an odyssey into the historical annals of the Lion City. The show demands it be appreciated as such: the Tans in the foreground, the independence of Singapore only as context and a backdrop. Unfortunately, Singapura shoots itself in the foot by cramming in too much, muddling its script and toppling its poise. Crucially, the company hopes to bring the story to the world stage. While local theatregoers may confuse Singapura with an elementary social studies class, an international audience won’t. After all, their perception of our fair city is built upon the concrete of Marina Bay Sands and not the rubble of our pre-1965 years. And, really, even if Singaporeans are already aware of these pivotal moments, scenes like the Hock Lee bus riots, the race riots and the Konfrontasi have hardly – if ever – been enacted so vividly on our own stages. It’s a shame that despite us going to a Saturday night show, the audience barely occupied a quarter of the theatre. Nonetheless, the cast soldiered on. Their acting borders on melodramatic at times, but most of the show is performed through song, and the power of their vocal chords is phenomenal. They are also well supported by the orchestra, which brought to life composer Ed Gatchalian’s melodic score. Singapura still feels like a first draft. There’s a lot of polishing to be done before it becomes a story we can be proud of. They’ve already modified little things – they told us they’ve made alterations including ‘a lyric change here, a lighting change there; a shortened intro here, a blocking change there’ – but we’re hoping they’ll eventually get around to working on the more major issues, too. And if they do, you can bet your ticket that we’ll be the first ones there.